I gave a talk to the monks of Prinknash last week, and happened to see a group photograph taken of the dignatories present at an important event early in the Community's Catholic history. Among the throng was the great spiritual writer Abbot Marmion, now Blessed Columba Marmion, and I got a rather poor photo of him on my IPhone. 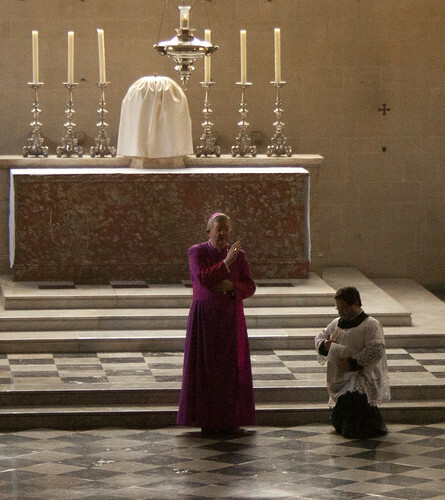 Nearly all the images of him currently on the web seem to derive from one photograph, so this is of some interest, since it shows him in mitre and cope. I might try to get a better photograph if I find myself in Prinknash again. I had to break off from my report in the previous post because my photos were still uploading to Flickr. Here are some more, and a report. See also the full set, or a slideshow. 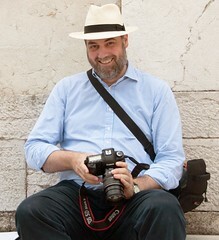 Another photographer has pictures here. I was on BBC Radio Oxford early on Sunday morning: here me here, at 1hr 35mins into the slot. 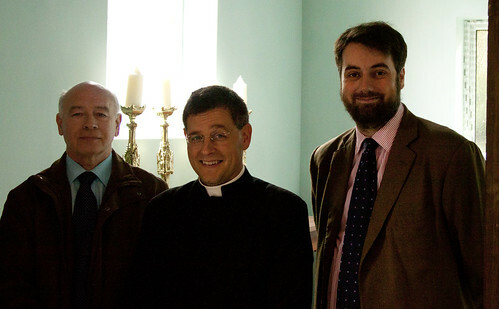 The Sacred Ministers were Fr Thomas Crean, celebrant, Fr Richard Conrad (Vice Regent of Blackfriars), deacon, and Br Gregory Pearson subdeacon - all members of the Order of Preachers. A number of Oxford Dominicans who have helped at previous LMS Pilgrimages were away, including the well known Br Lawrence Lew, and we had to make do with lay servers this year. However they did pretty well! They were MCed by David Forster. 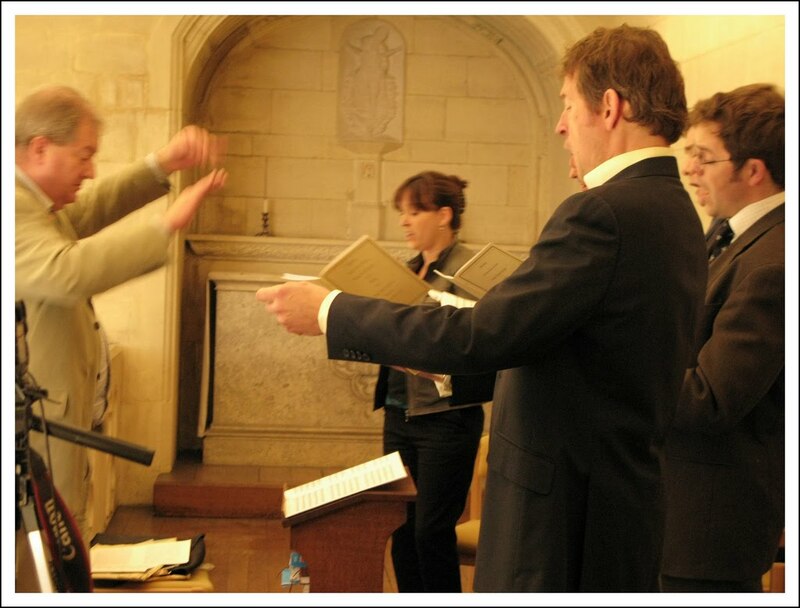 Singing was provided by the Schola Abelis. 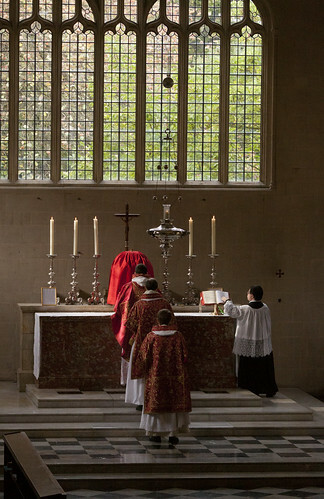 The schola is named after another Oxford martyr, a Magdalen man who was Queen Katharine of Aragon's chaplain and music teacher, who died for the faith in London in 1540. 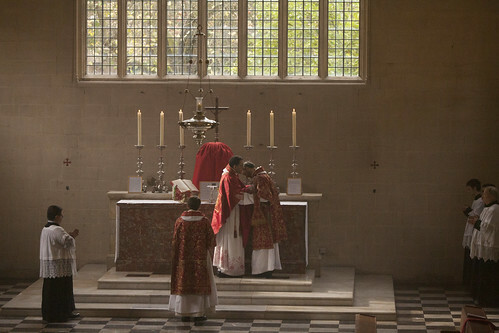 They sang the Chant propers of the Mass of the Martyrs of Oxford University, and an early English Mass setting, Missa inclina cor meum by Nicholas Ludford, and a motet at Communion: Byrd's Miserere mei. There were about 120 at the Mass, inlcuding representatives from Oxfordshire County Council and the Oxford Preservation Trust. With Malmaison, the hotel occupying the site, they have been extraordinarily helpful in making sure the plaque was in place in time, in the right place and with appropriate wording. The plaque is in fact one of a series planned for the Oxford Castle site. There was also a delegation from Blessed George Napier School, a Catholic secondary school near Banbury, led by the Deputy Headteacher. It was excellent to have them there, as the school exemplifies the local 'cultus' of Blessed George Napier, which the staff and students clearly take very seriously. By chance I met a recent graduate of the school over the Summer who recalled being told the story of Bl George Napier while there; it clearly made a deep impression on her. Napier was very much a local man: born in Holywell Manor in 1550, where his family were long established and continued to live for some time after, his father was a Fellow of All Souls and he himself attended Corpus Christi College until ejected for being a Catholic. Details of his life are sketchy but we know he spent 8 years in prison in London for his faith, and at the reletively advanced age of 46 joined the seminary at Douai. He was ordained and was back in Oxford ministering to the faithful in 1603. 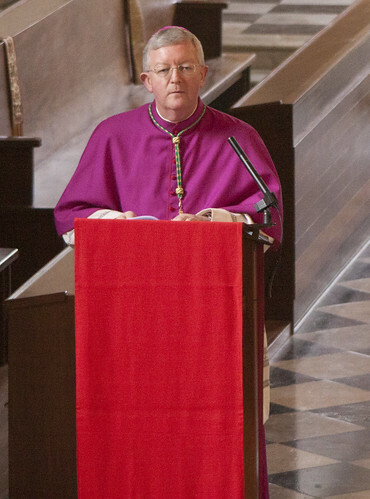 The Most Reverend Bernard Longley, Archbishop of Birmingham, preaching. He looked after the Catholics of Oxfordshire until his arrest in 1610. 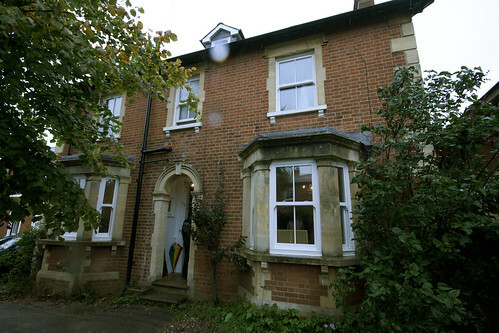 He was arrested while tramping from house to house outside Oxford taking communion to the housebound. He seems to have been based at Holywell Manor, where his brother was living. 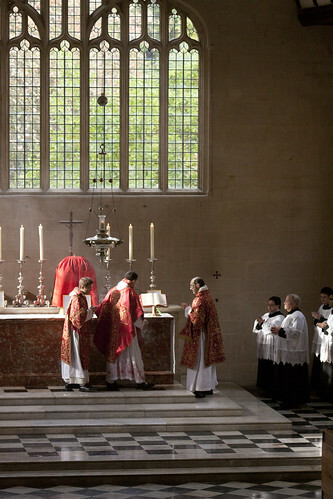 In those days Mass was said in a number of secret locations, including several pubs. The cellars of The Mitre, one such location, can still be seen today. While in prison in Oxford Castle he further offended the authorities by reconciling a fellow prisoner to the faith. This man, a highwayman called Falkner, proclaimed this fact before his own execution. And so Napier was condemned, for crime of being a priest, to hang as a traitor. 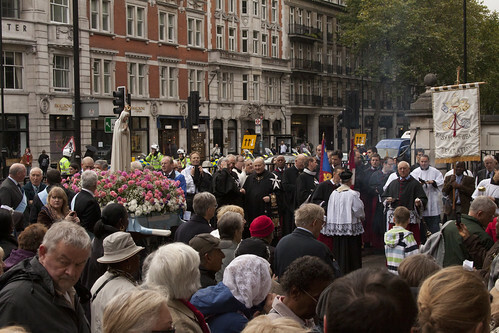 Archbishop Longley preached at Mass on the nature of martyrdom, and after a buffet lunch led the procession from Carfax Tower to the Castle, and then back to Blackfriars. 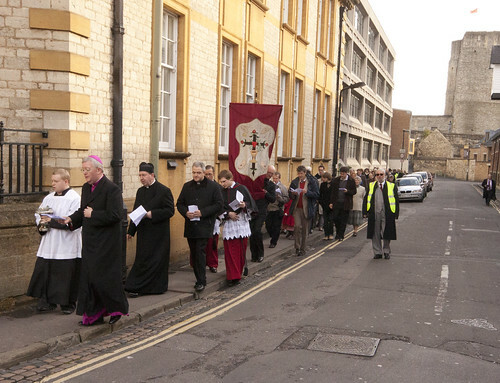 There were about 80 people in the procession, and on the way to the Castle we sang the Litany of the Saints. At the Castle Archbishop Longley blessed the plaque, and we sang the Te Deum. 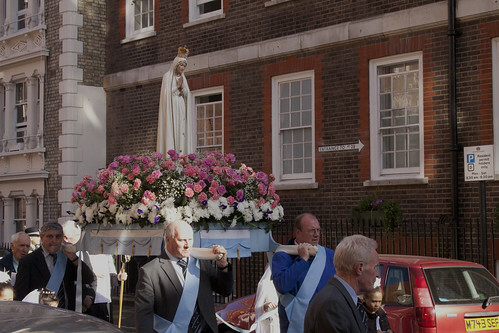 As we processed back to Blackfriars, we sang some vernacular hymns and the Litany of Loreto. Processing from Carfax to Oxford Castle. 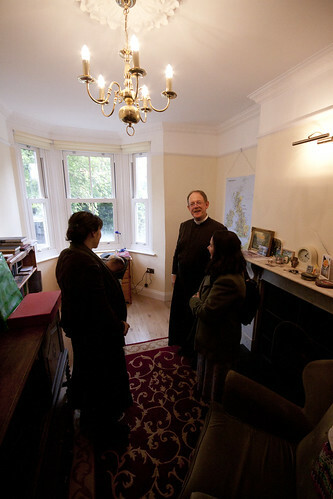 Archbishop Longley blessing the plaque. 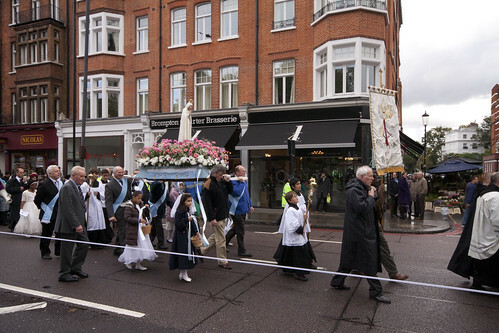 The procession was most impressive, with the large and beautiful banner of the Five Wounds which has been adopted by the newly founded Sodality of the Five Wounds, based at St Bede's Clapham Park (where the banner belongs). The Sodality provided the excellent marshalls. 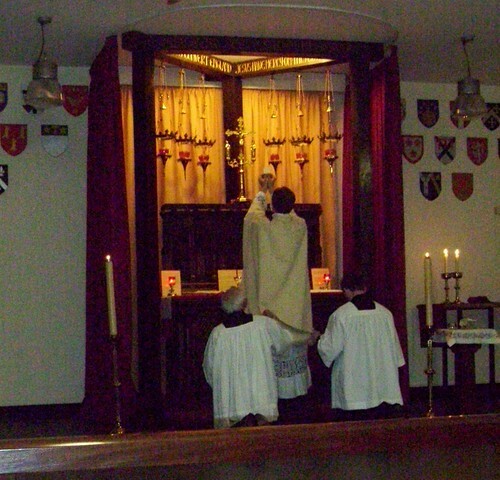 Also present were two members of the Confraternity of the Precious Blood, in their black and red robes. 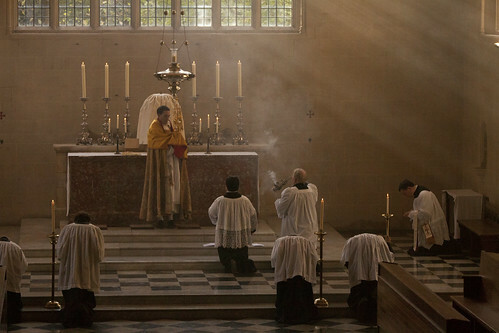 These are better known as the Brothers of the Little Oratory, based at the Brompton Oratory in London. 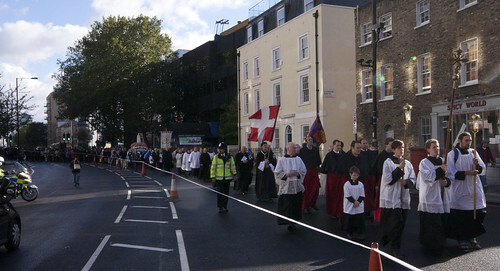 With the Schola Abelis providing support for the singing, we had the best procession yet. Archhishop Longley gives us his blessing on return to Blackfriars. After that, Archbishop Longley gave us his episcopal blessing. All these prayers and blessings the Archbishop sang: he has a fine voice and was a singer before joining seminary. 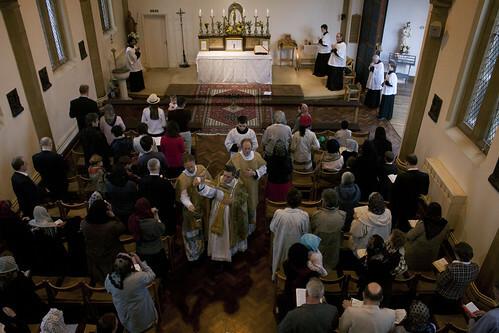 Benediction, led by Fr Thomas Crean OP. 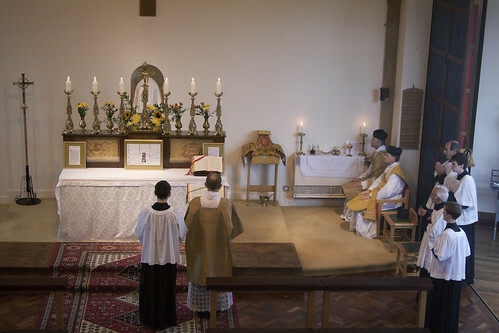 We then had Benediction, led by Fr Crean. This plaque, now blessed by our local Ordinary, represents the conclusion of a very long project of mine, to mark the two sites of martyrdom in Oxford in an appropriate way. 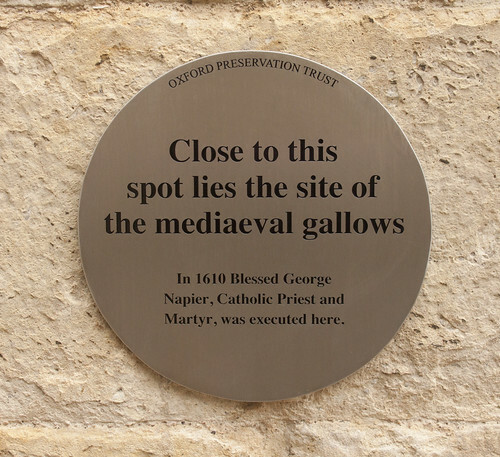 I began the process in 2005; the first plaque, in Holywell Street, was installed and blessed at the Oxford Pilgrimage in 2008. On that occasion I had to get the necessary permissions from the owner of the building (Merton College), and planning permission, after seeking initially to have the plaque done through the Blue Plaque scheme. We ended up with a much more impressive plaque than one of the 'Blue Plaques', which commemorate everything from obscure novellists to Oxford marmalade, but raising the necessary money for it was a headache. On this occasion all the adminstrative aspects were dealt with by others, but they were kind enough to accept my input on the position and wording of the plaque, and the timing of its installation. (It was installed on the Thursday before the blessing - phew!) However it was still a long haul - I started my enquiries with Oxford Archaelogy and Oxfordshire County Council in 2008, and by the end I'd also had a great many phone calls and emails with the Oxford Preservation Trust and Malmaison as well. Everyone, I must say, was most helpful and professional, but these things are complicated and time consuming. Archbishop Longley made the point that the spot marked by the plque is a 'holy place'. It certainly is: the places where the martyrs shed their blood are holy places. This is why it was so important for Catholics that they be marked; otherwise most people passing by would simply have no idea. We will continue to have pilgrimages to these places, and will now have something to see when we get there. But as well as the formal annual pilgrimage, the sacrifice of our great predecessors in the Faith will continue to bear witness to the casual passer-by, just as it did in the the reigns of Queen Elizabeth I and King James I.
I've processes my photos and they are uploading to Flickr - these ones have arrived. The pilgrimage was a great success. 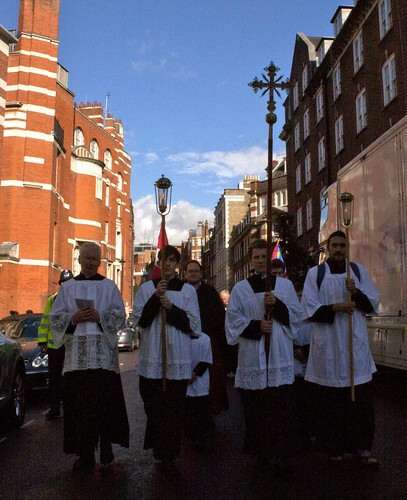 Despite a couple of conflicting events, more than 110 people attended the Mass, and nearly all of them came on the procession. 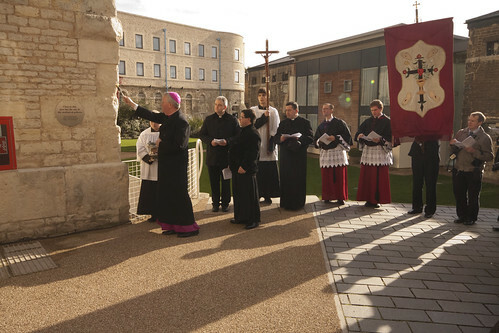 Archbishop Longley preached and blessed the plaque at Oxford Castle marking the site of the martyrdom of Bl George Napier. The LMS 'Traditional Catholic Calendar 2011' is now on sale; you can get it from your friendly local LMS Representative in many places, or order it from Southwell Books. It costs £7. The calendar shows the rich variety of events going on around the country, with Pontifical Mass in a Gothic Abbey Church and a thoroughly modern Parish Church; St Charles Borromeo in Stoke and Westminster Cathedral; Mass in a historic private chapel during a pilgrimage, a procession, a baptism and the Blessing of Throats on the Feast of St Blaise - a good few other things as well, including events of both the Fraternity of St Peter and the Institute of Christ the King Sovereign Priest. It includes information about the LMS and related events coming up in 2011. Magistri linguae Latinae mittuntur in scholas urbis ut favent arti legendi et scribendi. It reverts to English after that! It seems Oxford undergraduates are teaching Latin in Oxford state primary schools, in a project sponsored by The Iris Project. We (in England) should all know the Prayer for England in English; a friend of mine recently found the original Latin, and for the record I put it up here. It is interesting to see where it came from - a letter of Leo XIII, the prayer probably being composed by Pope Leo's English Secretary of State, the great Cardinal Merry del Val. Appended to Leo XIII’s apostolic epistle “Amantissimae Voluntatis”, 14 April 1895, Acta Sanctae Sedis 27 [1894-5] at page 593. O beata Virgo Maria, Mater Dei, Regina nostra et Mater dulcissima, benigna oculos tuos converte ad Angliam, quae Dos tua vocatur, converte ad nos, qui magna in te fiducia confidimus. Per te datus est Christus Salvator mundi, in quo spes nostra consisteret; ab ipso autem tu data es nobis, per quam spes eadem augeretur. Eia igitur, ora pro nobis, quos tibi apud Crucem Domini excepisti filios, o perdolens Mater: intercede pro fratribus dissidentibus, ut nobiscum in unico vero Ovili adiungantur summo Pastori, Vicario in terris Filii tui. Pro nobis omnibus deprecare, o Mater piissima, ut per fidem, bonis operibus foecundam, mereamur tecum omnes contemplari Deum in caelesti patria et collaudare per saecula. Amen. O Blessed Virgin Mary, Mother of God and our most gentle Queen and Mother, look down in mercy upon England thy "Dowry" and upon us all who greatly hope and trust in thee. By thee it was that Jesus our Saviour and our hope was given unto the world; and He has given thee to us that we might hope still more. Plead for us thy children, whom thou didst receive and accept at the foot of the cross. O sorrowful Mother! intercede for our separated brethren, that with us in the one true fold they may be united to the supreme Shepherd, the Vicar of thy Son. Pray for us all, dear Mother, that by faith fruitful in good works we may all deserve to see and praise God, together with thee, in our heavenly home. Amen. King Richard II attributed the political salvation of his kingdom to the intercession of Our Lady - together with his patrons St Edward the Confessor, St Emund King and Martyr, and St John the Baptist. 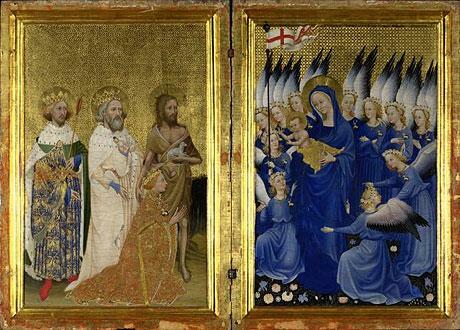 In the Wilton Diptych he is represented as receiving the pennant of his kingdom back from the Child Jesus in her arms. 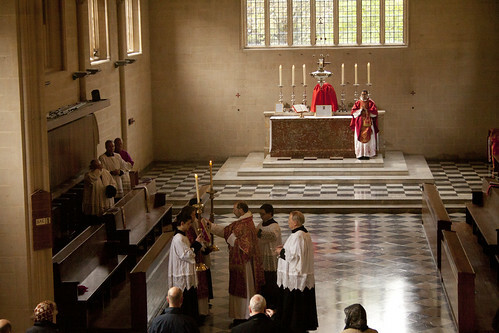 the LMS Oxford Pilgrimage is this Saturday! 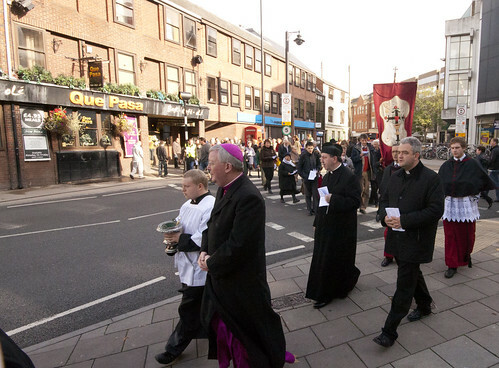 The Most Rev Bernard Longley, Archbishop of Birmingham, will be present at the Mass and will lead the procession. At the site of the Castle Gallows he will bless a plaque honouring Blessed George Napier, who died there in November 1610 for his priesthood. 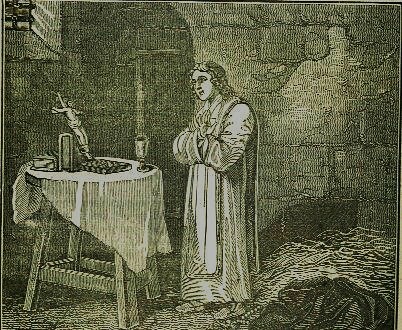 Napier saying Mass in his cell on the morning of his execution. 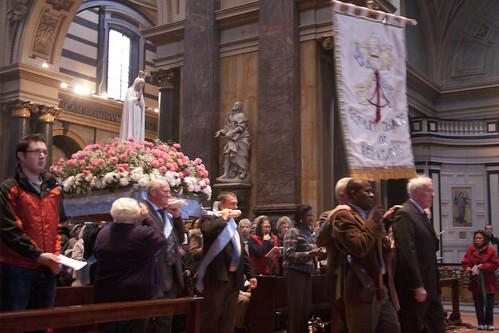 His friends had smuggled the necessary liturgical items in to make this possible. 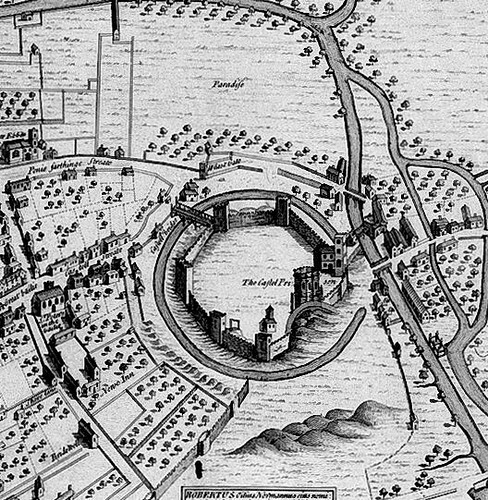 Detail of a late 16th C. map of Oxford showing Oxford Castle. Notice the gallows inside the Castle walls, the mound and the tower to the right: that is St George's Tower (the tower attached to the Castle chapel), which can still be seen today. New Road has not yet been built; nor, obviously, has the canal or the canal basin which was subsequently filled in and is now the Worcester Street Car Park! I was there. As always, it was a great occasion. It really deserves more support: this is a unique opportunity for large-scale Catholic witness and public reparation for abortion. Full set of photos; slideshow. Catholic schools more Catholic than the Church? 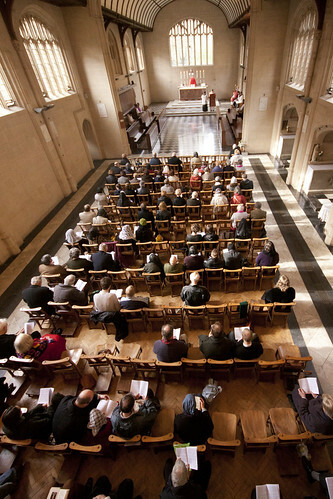 If you want to understand the attempts by Catholic dioceses to prevent oversubscribed Catholic schools from using involvement in parishes rather than geography as a way of winnowing out who should attend, then take a deep breath and read an article in the current Tablet by Westminster's Director of Education, Paul Barber, entitled 'More Catholic than the Church'. His argument is that all baptised Catholics have an (presumably equal, rather than absolute) right to Catholic education, and that Catholic schools should simply share them out by catchment area - isn't that the logical way of doing it? One puzzling thing here is that, while practice varies, baptism itself is usually conferred only to the children of couples who show some kind of commitment to the Church. Being active in their parish would be an example of such commitment. 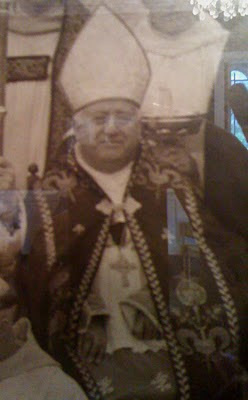 So what the Barber doctrine says is that when a child presents him or herself to a Catholic school, the decision on admission should not be influenced by the parents' commitment to the parish NOW, but rather to their commitment five or ten years ago when the child was, or was not, baptised. The bigger point however is that Barber is using exactly the same argument that was used twenty years ago to oppose Tory initiatives which allowed schools to compete with each other. People like teachers' unions said that when an oversubscribed school was allowed to cream off the brightest pupils with the most zealous parents other schools were damaged. The Tories replied that, just as with other forms of competition, when one school visibly drew ahead of others in terms of prestige, numbers, and funding, this would be an effective signal for the others to raise their game. Competition is a mechanism for spreading best practice - and indeed for developing the new best practice in the first place. The alternative is for bureaucrats to dream up 'best practice' in an office and impose is by fiat on schools - and that doesn't work. It was an interesting argument, back in the 1980s and 1990s. Much ink was spilt. Government policy flowed one way, then another. But it's over now. The 'command and control' approach has been tested to destruction. No one seriously doubts the value of a degree of competition between schools. No one who expects to be taken seriously, anyway. I have a short article in the current issue of a magazine called 'Networking: Catholic Education Today'. This is supplied to members of the Catholic Association of Teachers, Schools and College, and various other Catholic educational bodies. It isn't online so here's my article. 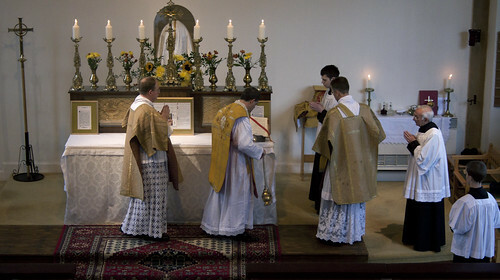 In issuing the motu proprio Summorum Pontificum which liberated the ‘older form’ of the Mass – the Mass as it was said up to and during the Second Vatican Council – Pope Benedict remarked (in the Letter to Bishops which accompanied it) that ‘it has clearly been demonstrated that young persons too have discovered this liturgical form, felt its attraction and found in it a form of encounter with the Mystery of the Most Holy Eucharist, particularly suited to them.’ The evidence for this which the Holy Father might have had in mind would include the many young people attached to the Traditional Mass who attend the Papal ‘World Youth Day’ events with ‘Juventutem’ groups, the 10,000 mainly young people who walk the 70 miles from Paris to Chartres each Pentecost, and the many young people who seek to join the newly established religious orders, of both men and women, which have adopted the Traditional Mass as their own. That is the evidence; what is the explanation? The Holy Father gives us a clue in the same document, referring to ‘the sacrality which attracts many people to the former usage’. 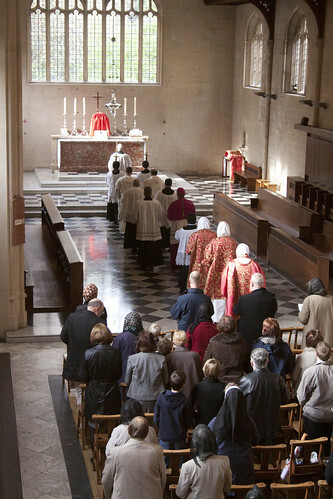 The ‘New’ Mass, published in 1970, was intended to attract people to the Faith by increasing its ‘accessibility’: prayers were to be easily understood, ritual actions simplified and easily viewed. 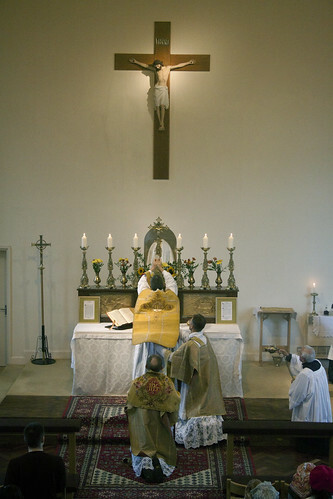 The flip side of this process is a loss of sacrality: the mysterious Latin words and partly hidden complex actions of the earlier form of the Mass manifest the fact that something sacred is taking place, something awe-inspiring. 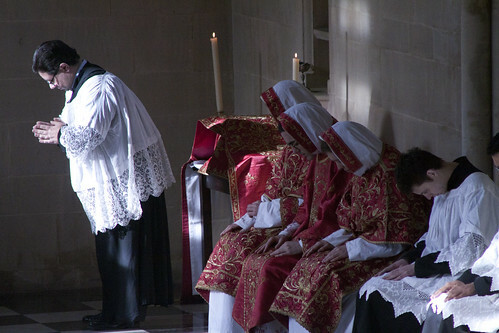 This fact is communicated not only through the meaning of the prayers and rituals, but by the overall effect of ordered and symbolic movement, the use of Latin, periods of silence, and sacred music. 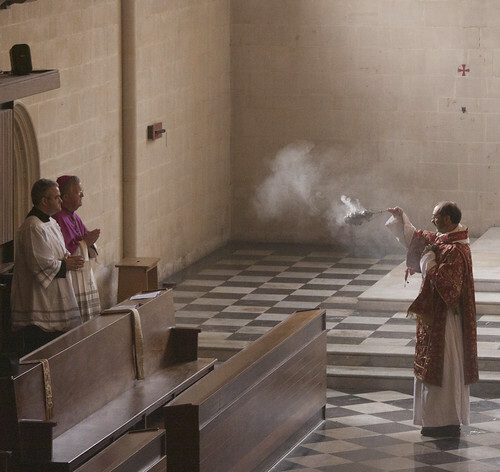 Through these things the Traditional liturgy tells us in a way which transcends words that we are in the presence of God, and that we are worshipping Him. This is not a failure of accessibility, but accessibility of a different kind. Sometimes the older generation finds it incomprehensible that young people should find order, dignity, and mystery attractive. But these things are perennially attractive to young men and women who instinctively want to leave behind what is childish, embarrassing, and banal. Today these things have a special attraction because they are so lacking in secular culture. 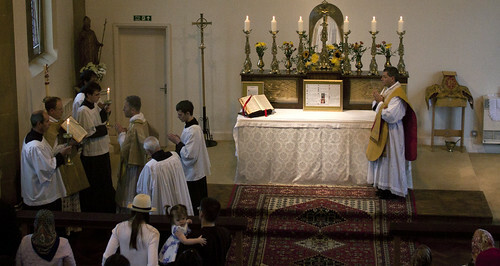 In the Mass they convey the most profound truths of the Catholic Faith, which are too often obscured in ordinary parish and school liturgies by free-wheeling liturgical abuses, as the Vatican instruction Redemptoris Sacramentum has argued: this kind of informality actually makes it harder to recognise Christ in the liturgy (RS 4-6). 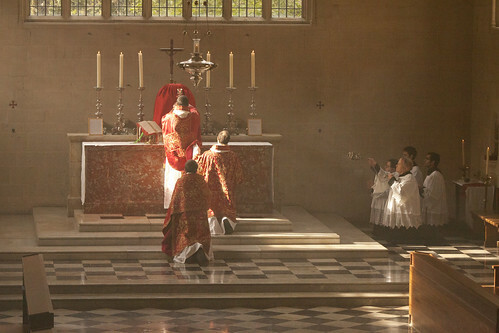 The Traditional Mass provides an escape to the inexhaustible riches of the Church’s wisdom and spirituality. 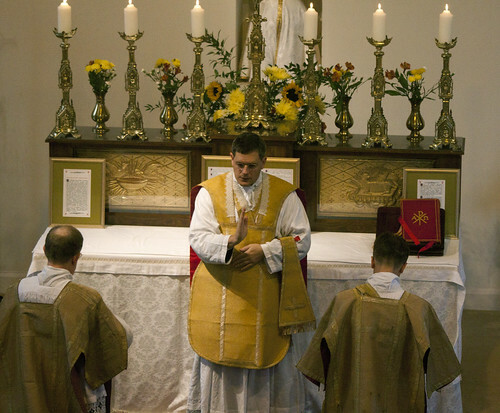 Most Catholics today under 50 have never experienced the Traditional Mass. 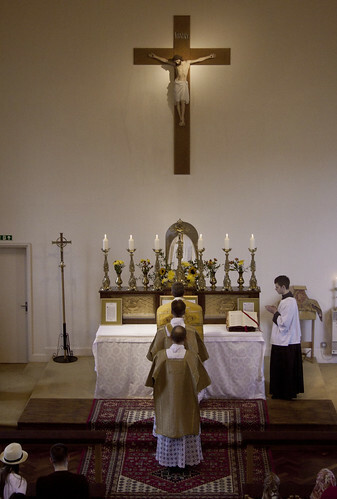 It is the Holy Father’s wish that all should have access to it, and benefit from ‘the riches which have developed in the Church’s faith and prayer’ (Summorum Pontificum, Letter to Bishops). pm to 3pm: Afternoon training session. Here is something left over from the Papal Visit: when the Holy Father came to Hyde Park on 18th September, there was a a group of traditionalist young people organised by the LMS and Fr Armand de Malleray FSSP. 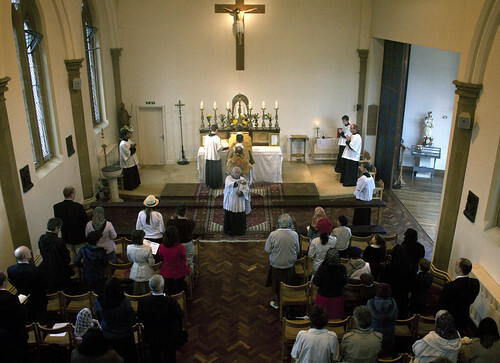 Fr de Malleray said Mass for them in the nearby Tyburn Convent; here is a photo; it is a bit grainy but the lighting must have been difficult. There are a few more here. This is the crypt; I blogged about the main chapel not long ago. Tyburn convent stands near the site of the 'Tyburn Tree', the tree-legged gallows where more than a hundred recognised Catholic martyrs were executed during 'Penal Times'. The site of the gallows is marked on a traffic island; here is a photo from Wikipedia. Charles Finch's excellent professional choir, Cantores Missae, which sings once a month at St Bede's Clapham Park, sang at the recent big Mass in Fr Tim Finnigan's church, and appear in many other places, have released their second CD. The discount available for bulk purchases is an opportunity for enterprising priests to make a little money in the run-up to Christmas, by selling them on. The Cantores Missae sang two years ago at my Oxford Pilgrimage Mass and were wonderful - there they are in the picture, in the loft at Blackfriars in Oxford. Mulier Fortis has made a video featuring their singing at Blackfen. If you want to hear samples of the CD you can listen here. and your order will be sent off by return of post. Please remember to give the address to which you would like the CD (‘s) to be sent! I have received this message from Richard Hawker, Sacristan of Holy Cross, the Dominican Priory in Leicester. 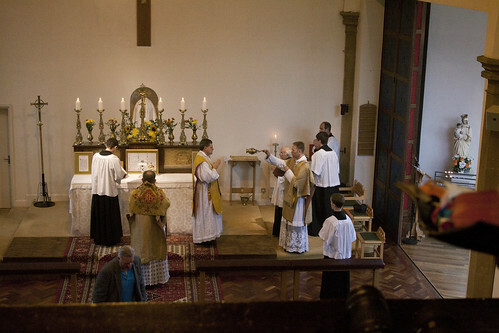 After the Mass celebrated by the Very Rev Fr John Berg, Superior General of the Fraternity of St Peter, which was the subject of my last post, all the faithful were invited to the house which now belongs to the FSSP's English apostolate round the corner from the church. Fr Berg blessed the house, and we all enjoyed a buffet lunch and explored it: it is surprisingly large, with nine bedrooms, several reception rooms and a large garden. It is habitable, but far from finished, as these photographs testify; what remains is decoration, however, and shouldn't take very long. Apart from its size, what is remarkable about this house is that it is an official residence of the Fraternity of St Peter: it has been canonically erected by the local bishop, Crispian Hollis of Portsmouth. 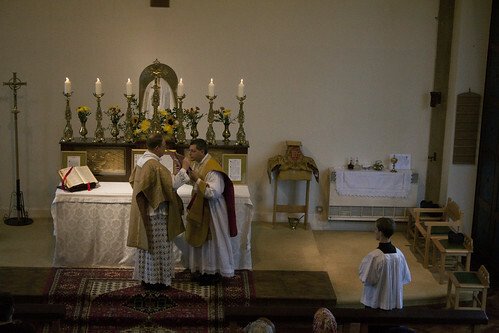 This is the first time such a thing has happened in England and Wales, and it means that the FSSP not only has an apostolate in Reading, but are an official and permanent part of the diocese. It really cannot be overstated what a big step forward this is. 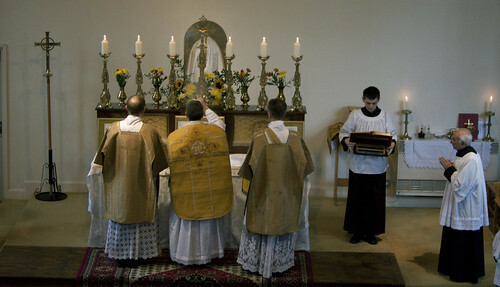 It should be noted that the FSSP has acheived this simply by working steadily at the pastoral coalface in Reading (as elsewhere); they have been saying the Mass regularly in Reading for about five years, and living in a rented house for about two. Their quiet hard work has earned them a place in what might not be thought to be the most auspicious diocese in the country. Floreat! 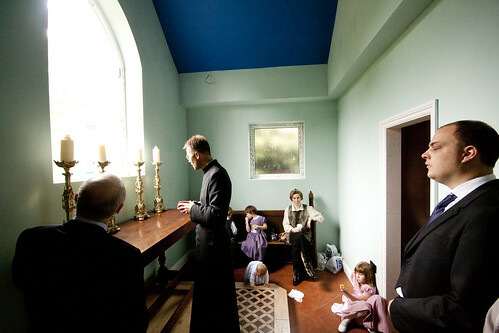 The chapel has not yet been consecrated - or even set up fully - but it is in the centre of the house. Among others on this occasion was Leo Darroch, the President of the Una Voce Federation. 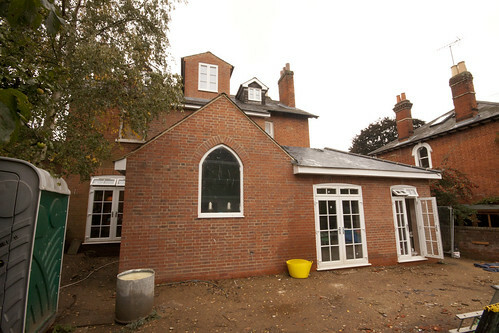 St John Fisher House is the residence of the Priestly Fraternity of St Peter in England, a Catholic international priestly society canonically established in the diocese of Portsmouth, and a registered charity: number 1129964. There are more photos of the house, inside and out, in this Flickr set. 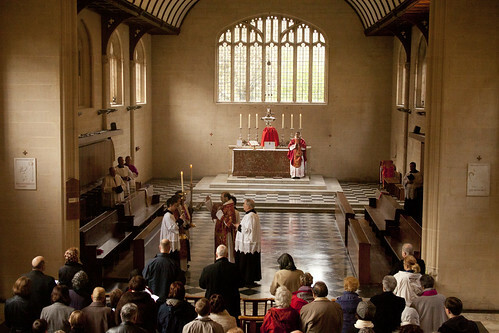 On Sunday the Very Rev Fr John Berg celebrated a Solemn Mass at St William of York, Reading. 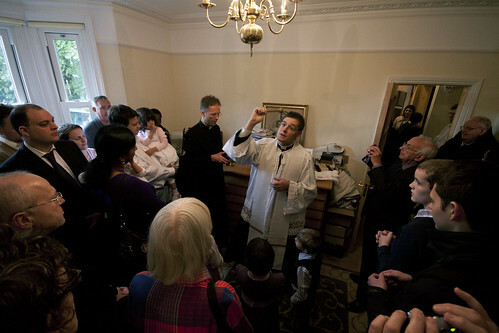 A short time ago the house recently purchased by the FSSP in Reading was given official canonical status by Bishop Crispian Hollis of Portsmouth, and Fr Berg was here to bless it and invite the faithful to its official opening. But first, the Mass. 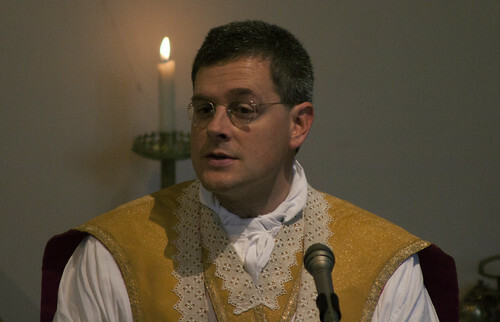 As the first Sunday of October, we celebrated the Feast of Holy Rosary, on which Fr Berg preached very movingly. 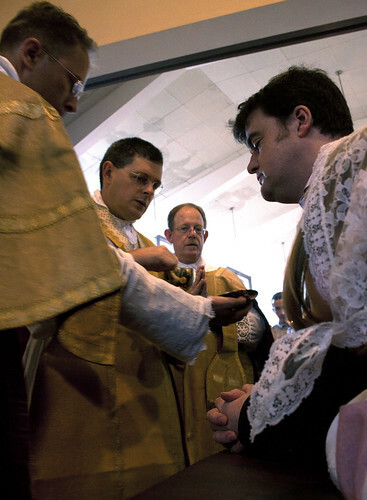 Fr Armand de Malleray FSSP was deacon, and Fr Simon Leworthy FSSP subdeacon. The church of St William, though long denuded of its ornaments, looks really rather splendid thanks to the tireless efforts of Fr de Malleray and the faithful to create the necessary steps, provide a carpet for them, to make a gradine for the candles and so on. It is a great tribute to the hard work for the restoration of Tradition going on in this community. See a slideshow of more pictures.